With the Thai government announcing a renewed effort to “protect the king” it is probably time to examine developments in their online campaigns to generate positive feelings about the monarchy. 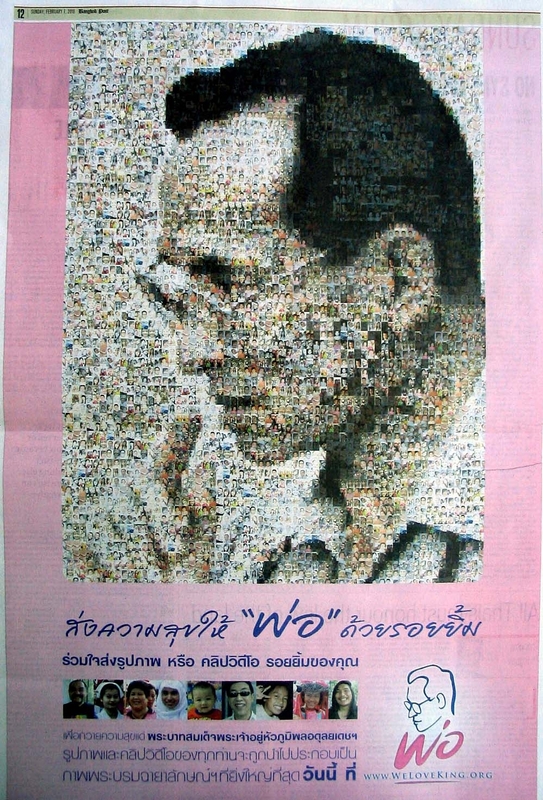 A long-time reader recently alerted me to a big advertisement in the Bangkok Post (above) trumpeting the creation 0f a website called www.weloveking.org. It was launched last week by Bhum Jai Thai political leader Newin Chidchob. The launch received wide coverage in the Thai media. This new website invites contributions of smiling photographs or videos to “give happiness to ‘father'”. When you click across to www.weloveking.org make sure you turn up the volume so you can hear the site’s theme song. It is also possible to download the song as a “ring tone” or “calling melody”. For uploading photos and videos, the site offers three easy methods, including Multimedia Messaging Service. Long-time New Mandala readers know that this is not the first government-affiliated effort to define appropriate online coverage of royal matters. All I hope is that this new site is maintained with more diligence than www.protecttheking.net which was, you might recall, designed to serve as a one-stop-shop for dobbing in lese majeste offenders. Readers may remember that the responsible official forgot to renew the domain registration. Now when you access www.protecttheking.net you get all manner of gratuitous financial advice from “the kings of protecting your pockets”. It isn’t, I’d wager, what the Thai authorities had in mind. Not to be put off by that loss of valuable digital real estate, the Thai government has established another new site: www.ourking.in.th. The branding on the preliminary page indicates support from the Office of His Majesty’s Principal Private Secretary and the Office of the Royal Development Projects Board, among other agencies. It is still in the early stages of development and they are even inviting public input on the site’s logo and template. With a total prize of 220,000 baht at stake you could play a major role in designing this tribute to the king of Thailand. To apply to enter the design competition you need to complete this form. Applications close on 30 April 2010. Well, not only Thai private and public sectors in the country are busy doing this business of promoting royal family. Thais instinctively associate royal propaganda carpet-bombing the airwaves with massive civil upheaval on the ground. The unifying function of a beloved king (whom I happen to admire despite all the mistakes he may have made) has been so serially abused by the military and self-interested power brokers who have run the kingdom that the face of the king is now a mnemonic for state failure, not moral triumph. It’s happening again, but in slow-motion. Now they’re trying to separate the power of the king from the king himself, who is possibly dying. There is no limit to their cynicism, fear, and selfishness. Newin promoting his love for His Majesty? Is there a Thai left who’s willing to buy that snake oil? Yes – it looks like there is now a full-blown coup under way. PPT had an interesting Newin related piece at: http://thaipoliticalprisoners.wordpress.com/2010/02/06/making-connections-that-count/ Does he have links to the female side of the palace? I don’t get how a German board game could be compared with the royal websites. The movie “Anna and the king” was a praise of Thai monarchy from Hollywood? Seems its not only the Thai authorities paranoid about seeing insults to monarchy everywhere, but now others seeing royal praise everywhere, even where there is none. I agree with Chris Beale. Not reported here was the size of the Red Shirt rallies held last weekend in Khon Kaen and Ubon Ratchatani. I read on another site, I think it was PPT, that there were 100,000 in Khon Kaen and 30,000 in Ubon. I have been to Khon Kaen recently and can report that there are billboards of Thaksin up all over the countryside, side by side with images of local Puea Thai politicians. Udon Thani seems to be the epicenter of Red Shirt resistance, with an estimated 300,000 listeners to a popular radio show by a local Red Shirt firebrand. It will be a big mistake for the Supreme Court to take away all of Thaksin’s seized wealth, because that will only intensify the sense of unfairness that is currently felt. Make no mistake, we are sitting on a powder keg. The events of last year’s Songkran will not be played out in the same manner, but something massive is about to happen. It is interesting that hardly any word is uttered these days about legal considerations in this context. It all seems to be about politics. And then you have to deal with this truly bizarre idea, on which one of the two important elements of the case is based (the other being “policy corruption”), that when the children of Thaksin and the brother of Pojamarn own the Shin shares, that they are truly independent owners, rather than Thaksin and Pojamarn, and that therefore any “conflict of interest” has disappeared. Is this a legal Fantasia or the real world of Thai-Chinese family businesses? Now, one might well think that Prawase’s strange way of thinking hasn’t changed much during the past 36 years (he has become older, but not wiser, so to speak). However, the final sentence of his quote might well be applied by the people behind http://www.weloveking.org and all others who currently try to use the monarchy and the king in order to promote their political and economic self-interests. Srithanonchai – good post, especially re. highly respectable Dr. Prawase. The point needs to be made that the Thai term “love the King” would more usually be expressed in English as “loyalty to the King”, at least towards a Western monarch. Thai language has a vast number of “Jai” (heart) words. An important point, because the “emotional nature” of Thai culture has often been remarked and written upon. In many respects this is a very nice, charming feature of Thailand – but the downside is that rationality flies out the window when conflict gets as intense as currently. On your point re. Thaksin’s family being “truly independent owners” : they’d be judged so under most (if not all) Western law. WLH #2 – they always saturate with Royalist music, etc. whenever there’s coup in Thailand. Your wife was completely right : it’s totally routine, and a 100% certain indicator that a coup is under way.